This is another season to send someone a merry Christmas card. But this time, try to spice it up a little. That is why this Christmas card here has an acrylic star, shinny reflective snowflakes, and 3-D holly corners that add some depth. Yes, it's definitely a simple but creative Christmas card that uses different materials. However, there are so many more ways to make it much more creative, if you want to. So have some fun with it. Cut out a triangular shaped tree from the holly symbols Christmas paper. The sides of the tree have zigzag lines. And the tree is 2.75” high. Glue this cut out tree on a 4.5” x 4.5” size tracing paper. Draw the trunk of the tree with a brown marker. Take the red pastel cardstock paper and score it straight in the middle so that it folds into two equal 8.5 x 5.5 sides. Open this red pastel cardstock card and lay it out on the cutting mat. Then measure out and cut a 3” x 3” square hole on the front of the card. This opening is 1.25” from the left, right, and top of the card. Use the rubber stamp and black ink pad to print “Merry Christmas” about 2” below the square opening at front of the card. 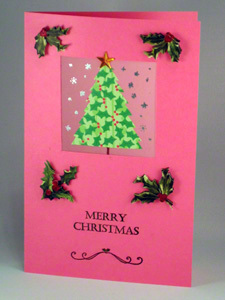 Use the embellishment rubber stamps and black ink pad to decorate the bottom of the merry Christmas card. Use a green colored pencil to touch up any enclosed space as needed in the finished ink stampings. On this card, the enclosed spaces are the holly leaves on the embellishment and the gaps in the letters. Flip the card over. 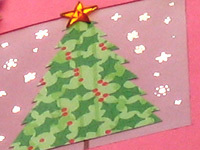 And use the tracing paper to cover the square hole such that the Christmas tree and trunk appear through the opening. Glue the tracing paper in place. Flip the card over again. Then use the silver marker to decorate the tracing paper area by drawing some sparkling stars or snowflakes. If you don’t have silver markers, you can use a gold marker or any other shinny or reflective marker. 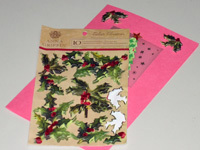 Peel off the 3-D holly stickers and stick them on the front of the merry Christmas card. For this card, there are four stickers close to the four corners of the square opening. Don't have the 3-D holly stickers? You can make something similar. Simply use small foam pieces to create the depth. In other words, cut out and glue a few holly shaped leaves with a few foam stickers in-between them.